The Adult/Child Fracture Kit is ideal fracture immobilizer for EMT. The kit contains multiple various sized splints for adult and child. The immobilizer splint kit is convinent to carry. The multi-functional limb splints can be used interchangeably and are designed for left or right side use. Replacement splints are available for separate purchase. Complete fracture splints is packaged in a practical water-resistant bag for easy carry. 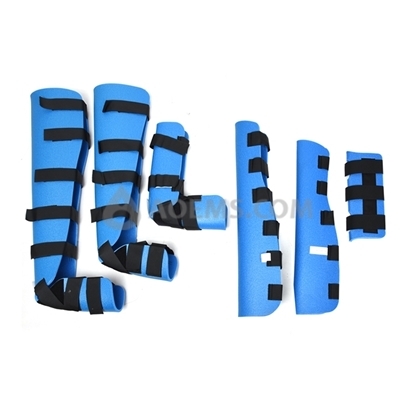 The fracture splint kit is ideal fracture immobilizer for EMT to rescue and immobilize the patients. The splint kit contains four various sized splints for adult and child. The multi-functional limb splints can be used for both left and right side. ♦ Made from tough,hygienic PVC-Coated from long service life. 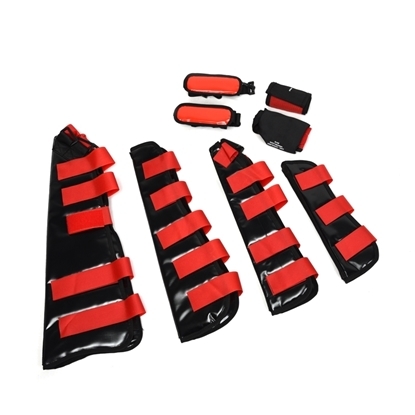 ♦ Used for immobilizing the injured forearm, wrist, arm, half leg, ankle and full leg. ♦ Effective box splints for suspected fractures at the scene of an accident. ♦ VELCRO® brand strapping secures the splint around the injured limb. ♦ Easy to clean. ♦ X-ray translucent. ♦ Durable and reusable. ♦ Padded comfort and easy to apply.